Disclosure: I received this product for free, for reviewing purposes. The opinions in my review are honest and my own. As any dog owner will tell you, dogs come with their own unique messes. From playing outside to getting in the trash, they have their own little adventures that can make a cleanup a challenge for their owners. With me getting the house cleaned and ready for spring, I have been trying to clean up our floors, especially the hardwood and laminate floors on the main level of our home. While I love my normal steamer, sometimes I want something a bit stronger to neutralize dog smells and get up those messes. While trying to find the perfect solution for my own family, I was approached by Shark, asking if we would like to review their Shark Pro Steam & Spray Mop. After looking into this mopping system a bit further, I was excited and couldn’t wait for our Shark steamer to arrive! Looking for a way to clean your floors and sanitize them at the same time? If so, we are happy to introduce you to the Shark Steam & Spray Pro. This innovative steaming system comes with 3 distinct mop settings, all of which are designed for certain floor types or cleaning needs. With the system’s non-toxic Steam Energized Cleanser, you can clean any floor surfaces, without leaving residue, and then steam clean to leave your floors clean and shining. With the system’s washable and disposable pad options cleaning hardwood, tile, or laminate floors just became not only easy, but fun! Personally, I was impressed with the Shark Pro Steam and Spray. Unlike some other systems, this steamer is very easy to set up and can be used almost right out of the box. All you have to do is snap up the handle, put water in the steaming portion, install the batteries that came with the unit, snap in the steam energized cleanser, plug in the unit, and go! It really is that simple! It is also very easy to move between the three different settings. I have tried the unit in all three modes and have been impressed with the results. Even our wood floors had the most beautiful shine after using this mop system, something that was very nice after Reya tracked in dirt from one of her trips outdoors. If you are moving between floor types, changing the steam setting is also very easy. All you have to do is push the button on the handle and wait until the light turns on for that specific mode. This allows you to spray clean, steam, or spray and steam your floors. Overall, I am very impressed with the Shark Pro Steam & Spray Mop and am delighted to give this unit an A rating! Would you like to purchase this awesome mop and steamer for your home? You can purchase the Shark Steam & Spray Pro on the Shark website. This awesome steam mop retails for $199.99, but is currently on special for $159.90 + shipping and handling. You can also find the Shark Pro Steam & Spray Mop on Amazon.com and take advantage of their special offer and free shipping if you are a Prime member! Note: If you are an owner of one of these units and have issues, make sure to contact their customer support at 800-798-7398. I enjoyed your review on the Shark Pro steam and spray mop.I liked that it looks simple to use and has some awesome results.I will have to take a closer look on Amazon and get one of these for myself.Thanks for posting this. I love this product! It’s light, unlike those other heavier popular brands, and it uses steam to disinfect as well as clean. My friend has one and I want one very badly. Her floors are always so clean and it only takes her a few minutes to get it like that! What a great little machine it sounds so easy to use and will do the job thanks for the review. Adapting the first sentence of your review: As any parent will tell you, children come with their own unique messes. From playing outside to getting in the mud, they have their own little adventures that can make cleanup a challenge for their parents. Thank goodness for ingenuity and the Shark Pro Steam Spay mop that rescues both dog owners and parents alike. when someone does not care what comes into the house on his shoes, this mopping system is a real help. Thanks for the info. I may want to try this on my hardwood floors. Very good review! I have wanted a Shark for some time and your review has influenced me into purchasing one! Thank you so much for this review. With 4 little ones in the house, the word “mess” is apart of our everyday vocabulary. I will definitely be looking into purchasing one soon. Your review confirmed how bad I have been wanting this Shark Pro..not just want but really need it too…Love the steam/clean feature!!!! I had a really good steam mop until I let some people use it and they broke it. I loved my steam mop made my floors look really clean! I would love to own a Shark Pro Steam Spay mop, this has been on my bucket list for a long time. I feel like when I mop, my floors are not getting clean, this would be great. I have been salivating over this thing. Yes, a mop! I was hoping to maybe, just this once, get it for mother’s day, maybe? I have such issues with any kind of mop I buy, they all just feel so gross after just a couple of uses. I have been looking for a new way to get my floors really clean. Thanks for the review! I need this! My floors are so hard to keep clean. It’s difficult finding something that wont mar up the hard wood flooring. This sounds like a wonderful product…thank you for your review and have a lovely day. I enjoyed your review. I like that it is very easy to use. I don’t have a hardwood floor but it would sure be a help in the kitchen and bathroom. I love hoe easy it is: just snap up the handle, put water in the steaming portion, install the batteries, snap in the steam energized cleanser, plug in the unit, and start to steam! Awesome! I was just talking on the phone with my neighbor. As usual I was complaining about the dog hair all over my carpets and wood floors. Every time I think I’ve removed it all, back it is within 24 hours. I’ve been hoping to get a new appliance such as this one to help solve this dog-hair problem. You still have to vacuum but it really helps keep down the mess! This is a great product, I borrowed it from a friend to use and now must have my very own! the steam -spray mop sounds really great.just what i need. This looks like the perfect system that I need. I have two large dogs and a very muddy backyard! What a great review. I would love to have this for my new place. Great review I would really like to try this Shark Pro Steam and Spray Mop I need something that is easy to use and does not take a lot of time to use.This looks like it would be great to use. This would be perfect for my household. I have 2 Chihuahuas and 1 father 😉 They are all very messy and this would clean our laminate flooring so well. I have been looking at these and wondering about them and now I know. Thank you for the review. Wow I just got done mopping all my wood floors which is whole house except for kitchen. Sure wish I would of had this. I have been checking into this kind of thing and can’t make up my mind. Hope I win it. Thnx for opportunity. I like that you can steam you can scrub and it works on all kinds of floors. We have lots of animals and they are super messy. I have to say I love that this is a steam cleaner. I don’t think you can get a floor any cleaner than to steam clean it. I have hardwood floors throughout my house and I would love a Shark. I heard they were amazing. Thank you for the review. Your floors look amazing. As a grandmother to three grandchildren under the age of seven and the owner of three cats (Sunday I will be taking in a fourth rescue kitty!) this would be a God send! I am forever on my hands and knees cleaning up after all of them! I love the review and want to own this! These are really good at cleaning those dirty messy floor’s. I have used one in the past and this is one of the things that I like most about it; * This specially formulated cleanser leaves floors cleaner with no dulling residue. I have 3 little boys, a husband and a dog- all of which forget to wipe their feet/paws way too often! I scrub and within the day, there are prints on my laminate floor again. This looks like a great product to help me out. Thanks for the review! Looks like a great product for cleaning floors and killing germs. I try to keep away from chemicals when possible and the steam mop insures that chemicals are not needed. I have been wanting a Shark Steamer but I wasn’t sure how well it would work. After your review, I feel confident that I would like it. I also have 2 dogs and a cat in the house and they seem to track every-thing inside. I have small grandchildren that live with me and they love sitting on the floors playing and I worry so much about germs. I think this Shark steamer may be exactly what I have been looking for. Thanks for a great review. I would love to try this out on my hardwood. With a black lab and 2 young children, keeping yhe floor clean is quite the challenge. Thank you for the review. I’ve been looking for something that is lightweight and easy to use for our kitchen and bathroom tile areas. I’ve also heard that the Shark Steam and Spray Pro can be used on upholstery. I’ll have to do my research, but I am already sold. I want to get one of these mops. My house is 3/4 hard floors. I do have the Shark Rotator Pro Vacuum and it is the best vacuum I’ve ever had. So if the Steam mop performs as great as my vacuum then its going to be an awesome mop. I’d love to own this mop. After reading your review, I’m sold. I’ve really been wanting to try the Shark Steam Mop Pro but was still undecided. I didn’t know they’ve come such a long ways since the first steam mops. I love that it has settings and allows you to scrub. This would really help to keep my floors clean, especially since I have a little one crawling around. Nice review. Perfect for folks with indoor allergies! Forgot to write two sentences. The review was great, thank you for that very informative review blog. As I stated earlier, this would be perfect for those with indoor allergies, which I suffer from. 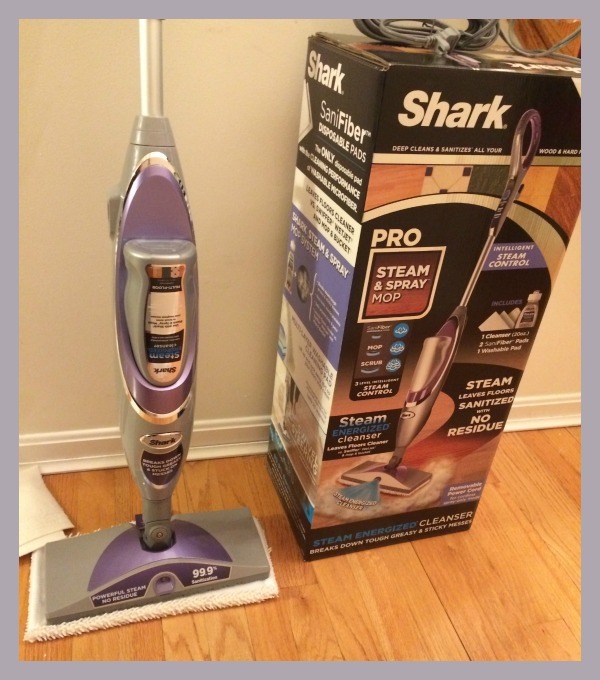 I would love to be the proud owner of this wonderful product, the Shark Pro Steam and Mop! I would love to try the Shark steam pro after reading your review. Their is however one more thing I would like to know. Can you use any cleaner in this machine or do you have to use a special solution? I didn’t see this information in your review. I have a very old house with the original wood floors. I now know this will help me clean and keep them clean. Thank you for the great review this is now on my must get list. Thanks for the wonderful post and review! I have probably what is the very first Shark Steam Mop model and I have always loved it, but I can tell these newer models are even better…. the best that they have come up with yet! I would love to win this to gift to my mom…. she has always wanted one! Thanks for the post and chance to win! This would work great in my house because I have mostly non-carpeted floors. Bare floors are harder to keep clean and with the Shark Pro Steam and Mop would be ideal for my floors. Smaller grand kids won’t get those really dirty knees anymore. What a great and affordable product! Would love to give this a try on our bathroom tiles. This would help me so much in the bathroom! I hate linoleum flooring with a passion and put off cleaning it as much as I can (which isnt long). I also hate using harsh chemicals to clean up all of the lovely germs and pee on/around the toilet (which no one seems to know how it got there). The one time I got on my hands and knees to scrub every nook and cranny of our bathroom floor and when I was done it looked the same….I was so disappointed. It would be nice not to have to do that again but know for a fact that I did everything I could to clean and sanitize it. l love that it is so easy to use right out of the box! the fact that steam is all that powers this is pretty cool! i like that its new settings allow you to do scrubbing! something the older mops didnt do! sounds like a great little machine for my floors! This is very nice would love to win this. I already own a shark mop but a different model. it doesn’t have all the features this mop has. I don’t know if I like the fact it runs on batteries because I use mine a lot as it is now. I would love to have one though mine just has one setting and that’s on lol. Thanks for the info on this sweeper. I love the idea of it being easy to set up. And how well it works on different floors. I am elderly and this would make for easy cleaning of my different floors in the house. I have 2 dogs, a husband & a son, need I say more!! This would be a great way to clean up their mess without using harsh chemicals. Thanks for the great review! This review is really in an depth review. I like the fact that it is easy to use. Thank you for the review! We have hardwood floors in the kitchen/dining area and, after a year of living here, still haven’t found the right routine. I end up spending a lot of time on my hands and knees scrubbing to really get it clean! I can’t tell you how excited I am about this contest! I had the original Shark Steamer (seven years) and it just gave up its steam last week! With three dogs, it was used a lot! I miss it so much and truly hope I can win this! Shark is a great product and your review makes me miss mine even more! Thanks! Thank you for the chance to enter for the Shark Pro after the reviews I have read. I have got chronic allergies to dust mites and what better way to keep them under control with your Shark Pro Steam Mop. I have tile floor throughout the house and with a Shark Steam and Spray Mop to make life easier and more comfortable SOLD! My old mop and bucket have just been evicted. I had the original Shark bought it from Walmart. I would love to have the larger more powerful one. I like that moving between floor types, changing the steam setting is also very easy. I have a dog that tracks mud and stuff in all the time. We are forever cleaning the floors. Thanks for the review. Might have to upgrade to this someday! We need this so much, 4 k, 4 c, lots of messes, this looks to be the perfect solution!! Thank you so much for the great ideas & review. I love how the shark works. My past experience with this brand has been only good. It seems to have extra power to get things done. I would love to own this model! I love Shark! I love the steam mop. Mine broke after two years so I am definitely getting another! I have heard so many good things about the Shark Pro Steam & Spray mop but thid review does a great job of going thru the steps needed to use it. If I don’t get something new I well need to get on my hands and keens. I would LOVE to use this on my hardwood floors!!!!!! I KNOW that it would help keep my floors Sparkling ALL the time!! And I KNOW that my kids would be able to use it with no problems; making their chores abit easier for them!! This Shark Pro Steam Spray mop is amazing because it steam cleans a lot of different floors. I love that it is non toxic and sanitary in getting the stains and grime off of my floor. I would love to own one of these amazing Mops! I have really been wanting to get one of these for myself. I think it would be great for the tile downstairs, especially since that is where the dogs spend most of their time. I owned one of the older Shark products and it worked really good. I loaned it out and never got it back, so this would be a nice prize to win. What an awesome review, too. Thank you. i loved the old steam mop, so I can’t wait to try this one. It cleans so good but your floors are not shiny after, that is the only issue for me. The Shark Pro’s ease of use and it’s powerful steam and spray mop is ideal for all the tile flooring in our house. Grout is not my favorite when it comes to flooring but with this product I can rest assured that my floors are really clean. I have been wanting one of these! I love that it is easy to assemble and switch between floor types! I was wondering what kind of batteries do they use? After reading all the information on the Shark Pro Steam and Spray Mop. Here are the reasons why I would use the Shark Pro.Fact one-System’s non-toxic steam energized cleanser.Fact two-light weight and easy two use.Fact three- Its ready to use right out of the box. Fact four- Three mop settings making it possible for all types of floor surfaces.Fact five- Washable and disposable pad options.Fact six- Reasonably priced.Fact seven- Awesome!!!!!! I have a store brand steam mop and not entirely happy with it. After reading the review for the Shark Pro Steam & Spray Mop, I really think this is the one I need. Thank you for the chance to win a shark mop. I would love to have one of these. I have heard and read so many great things. Good review. The Shark Pro Steam and Spray Mop makes maintaining tile floors so much easier. It would be very handy to have around the house. I like that this unit uses steam and/or a cleaning solution. I think that both at the same time would really clean the really nasty stuff off of the floor. Also, I like that it has a reusable cleaning pad that can be washed 20 times or so before it needs to be replaced. Thanks for the review and I hope to win one, our laminate and vinyl floors would be grateful. We are getting new flooring in the main areas and this would be perfect for keeping them clean! Much better than the old mop and bucket. Thanks for the chance to win one! I have used so many Shark products over the years. I have never been disappointed by the Shark brand and would love to win. They are very good quality and easy to use! I’m hoping this would work on old vinyl floor I have.I know it would be easier then on my hands and knees.I would love to win this and put it to the test. Good info! I just love shark and their products. I have the hand held steamer, the euro floor steamer, and the navigator vacuum. I have fallen in love with these products. However just Saturday my youngest son knocked over my floor steamer and the handle snapped off. I am now in the market for a new one. Thanks for the review! I love your review on the Shark Pro Steam and Spay Mop.I am a bit of a germ ophobic,and this is what I need.I have 8 grandkids running in and out of my home all the time making messes.I love that it has the washable and disposable pad options too. I love this product! We have just recently purchased a house and have hardwood floors downstairs. I have tried numerous products that I am not happy with, not to mention the strong smell of the chemicals to use them. With a toddler running around, a dog that sheds and another baby on the way this looks perfect to help keep up with keeping those floors clean! i have always loved the shark pro products! thank you for your review i love the descriptive sentences and the pictures you provide also!!! I really enjoyed your review on the Shark Pro steam and spray mop.Living with a cat and a dog there always seems to be a mess of hair around and with 5 grandkids,you can be sure i put the Shark Pro steam and spray mop to work right away.Thanks for the chance to win. I really liked what I read about the SHARK PRO. It looks easy enough for me to use from my wheelchair. Hope I am the lucky one. Everyone have a good day. I really like how easy it is to set up. I also like the different settings for different flooring needs. I’ve never owned a steamer before but I would love to. My floors really need some TLC. This looks awesome! We live in an old farmhouse with old hardwood floors, plus we have added big rugs and some carpeting where there is old linoleum. We could really use this! Sorry to say that Ms Bewley did not research the reliability and longevity of this product. She would find it rated below their competition in almost all surveys. Shark boast about customer service but there are too may cases of customer’s being disappointed. The BBB rates them at a grade of D. Like Ms Brewley I am going on my experience with this product. Thank you dropping buy and taking the time to write a comment! I always love hearing from my readers! As the disclosure states, I was asked by Shark to review their latest model of this product. I purposely keep myself blind to other reviews until after I do my own product testing to make sure it doesn’t influence my opinion. All I can go on is my own experience with the product. My long time readers will tell you I have no issue giving bad or mediocre reviews when products don’t function as advertised. Since there were no issues with the units sent to me, I cannot judge one way or the other with their customer service. From what I am seeing, the latest model also has a 4 star rating on Amazon.com. I enjoyed your review! I would love to win one of these! I have been looking for something that gives a deeper clean and no residue. My niece would really love this since she will have a new baby soon! omg i really need this! lol we dont have any kind of mop right now so we are doing the hands and knees since out kitchen is small in our apt. I used to have an older model Shark steam mop but it broke when I moved last. 🙁 I loved using it because I have a toddler, a dog and two cats and I don’t have to use any nasty chemicals to get my floors clean and sanitized. I definitely need a new one! Thank you for the review. This is something I need for my floors hardwood and tile. I have 2 cats that probably make as big a mess a 1 dog. This looks like a great product to keep floors sparkling clean. I like the different settings for different floors – not all steam mops have that. I am a dog owner and have kids that are always making cleaning a challenge and I would love to know that the floor they are playing on is as clean as it can be…would love to try this in my home…thank you for the chance to win it. Thanks for the review, I WANT one of these! We have one dog, but we are dogsitting my daughter’s dog. They make so many pawprints on our wood floor, especially right now because all the snow is melting off and there’s quite a bit of mud for them to trample around in. I’ve been swiffering and swiffering, but it’s not powerful enough, this looks like it’d be powerful enough, and it looks like something I could really use right about now. Steam cleaning seems the way to go today. I would love the shark steam cleaner for my bathrooms & kitchen areas. It should be fast & convenient too with no chemicals. My mother-in-law has one of these Shark Pro Steam and Spray mops and she will not use anything else. She is an elderly woman and she says its so light weight and easy for her to use and it cleans so good that there isnt anything else she wants to use. I know if she loves it, I have to get one cause I know I would love it too. I recently had a puppy that turned out to need more training than can provide at this time so had to give her up, need to clean stains she left from carpet, please and thanks!! I own a cleaning company and we ONLY use Shark vacuum cleaners, we currently have four. What we don’t have (YET) is a Shark steam mop and it is on our wish list! LOVE Shark products! WOW NOW THIS SURE LOOKS LIKE A HANDY PRODUCT. I KNOW IT WILL COME IN HANDY AT MY PLACE. I would love a way to clean my floors and sanitize them at the same time, and this machine sounds wonderful. And I am lazy! I love that it is easy to use right out the box. That’s important to me because I’m not too intelligent when it comes to machinery. Would love love to win this. Thanks. Great review! Makes me what to go buy one right now! love how simple it is to use. My daughter has one of these and she loves it. I have been wanting one for a long time. I am disabled and having one would make my life so much easier. I sure hope I win because I know it is a super product just by reading about it. I have kids that play a lot of sports, dogs, cats, birds and reptiles – which means a lot of cleaning. I love the fact the Shark is easy to use and does not leave any toxic residue, which is very important to me. Sounds like something I could use around here and I like that it sanitizes with steam so I don’t have to worry about harming my kids or animals with toxic chemicals. I have trouble with strong cleaning solutions. But I want to sanitize my wood and tile floors. The Shark steam and sanitizes and would be a good option for me. Because I am disabled by pain, I am always looking for ways to clean my home efficiently, with less bending and reaching. Having to clean with a mop and bucket is torture for me, so it would seem that having a mop like this one would make life a little easier. I already have a Shark steam mop system, but it didn’t come with all of the attachments they showed on tv because I bought it in a store instead. This mop appears to resolve some of the issues I have with the other mop system. Unfortunately, the price puts it far above my reach on a disability income. It’s not a bad price for the product, but it’s the income situation that breaks the deal. 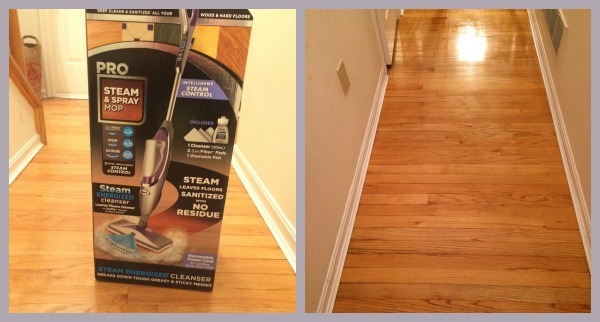 My daughter and I love the Shark Vacuum and wanted to get the PRO Steam and Spray Mop. She actually beat me to it. I’m moving across country and was going to buy one when I got to my new home. She ran to the store and bought one for herself to care for our home while we are gone. I wanted so bad to open it and use it. But I couldn’t do that to her since it was hers…so I desperately want to win one. This is just like dangling a carrot in front of my face! Being disabled…this would be a total assest to help me keep my floors clean! Having dogs, it’s great to have a review from someone with a dog as well. Although I have a low odor breed, it still builds up. And of course there are the muddy footprints that come with them. wow I’d be in heaven with this looks so easy to use and with two dogs hubby and grandkids I could sure clean up a lot faster!!! I am thrilled to see that you are a dog owner and understand the messes that come with the territory! While we don’t have hard wood at the moment, we are planning to re-do the floors throughout our home (hard wood and tile). I would definitely love to have a Shark to help me keep them clean from dog and kid messes 🙂 I have the Bissel Swiffer steam mop as a cheap way to clean the tile (where the biggest dog messes are), and I am NOT impressed. I would absolutely LOVE to win one, but with your review and the fact I am going to need something better to clean our new floors when we get them, I may have to go buy a Shark! It really would be awesome for you! When Reya come in from playing, we have mud all over our wood floor entry way. I found that steam and the tiny bit of cleaner that Shark sprays out works great. The only problem I have found with it with our dog is…well…traction. The floors are so clean that our 90 pound dog goes slipping and sliding at full speed right into the front door! lol! Great Review! I agree about having dogs. My dogs sure make it challenging to keep the house clean! I love that the Shark Pro Steam & Spray Mop cleans without harsh chemicals so I don’t have to worry about exposing my pets or kiddo to toxic cleansers. This would be really helpful in so many areas of our home. I would LOVE to own this steam & spray mop. Having a Shark would be great with two very furry pets! This sounds easy to use and i like that it has different settings. I have 13 pets, so this would be great to use on our floors and not harm them. I really would love to win this. I have wanted one for such a long time. I would use it on a daily basis because I have 6 young grand children living with me and they are always making a messes all over. I also have a dog that love to go outside and dig in the mud and then tracks it inside. Thank you so much to Shark Pro Stem & Spray and Donna Hup for such a wonderful (thoughtful) giveaway. I need it to clean my kitchen and keep it steamed and disinfected. Thank you for the review. I have added this to our wedding registry because I now need one! This would really help in cleaning my home. I have four kids, four cats and a husband lol….really could use this! I loved reading your review, it has confirmed that this another amazing, and wonderful product from Shark. I am very OCD about how clean my house is and would love to get one of these machines to help with my children’s little messes, I also have a 6 month old that is starting to crawl so sanitized floors is a must. Thank you so much for your wonderful review. I love the versatility of this mop! It would help me with all these pet spills! I read your review,and I have always wanted a Shark Pro Steam~now even more. Thank-You for a chance to win. I really like that it is so lightweight. Its great that it can be used on both carpet and wood floors. Oh wow!! This would be awesome for us. We have two dogs and a rabbit so clean up would be so quick and easy with this! Thank you for the great review! I’ve read your review and I’ve seen commercials for the Shark Pro Steam and I agree that this is an effective cleaning tool as well as a sanitizer. we can mop our floors several times a day and still not get all the germs, I believe the steam will kill those left over germs and lift other things left behind by our mops. I would live this for my hardwood floors. I just broke my swiffer today!! I like the information about this. The 3 different floor settings, and the easier convenience of setting it up and to use it make it sound like a product I want to get. A definite plus for something to use by my mother who has a hard time using some other products. I would love to have this in my home. With kids and a dog, sweeping and moping just doesn’t get it done how I want it to be. It looks like something that would encourage my kids to use too. We just moved in to a house with ALL wood/tile/laminate floors! I need a shark!! This one would be amazing!! Thanks for this review! It sounds very easy to use, light and, best part, powerful! What else can you ask for when you have a house full of little ones, your partner, pets, and friends/relatives?! I have hardwood floors in my house and struggle to keep them clean. This looks like my answer to that problem! I have the Original Shark and love it. The pro would be fantastic, we try to keep a chemical free home and this would be awesome. Thanks for the information about the Shark pro steam spray mop! 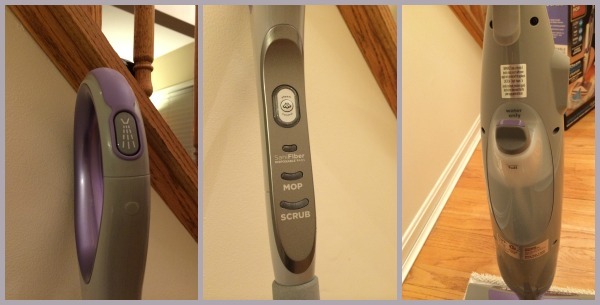 It looks like a great product and a way to get cleaner floors more easier than the scrub brush and bucket method! I will definitely give this product a serious thought, and may be able to fit it into my budget! Thanks again for the review! I would love to win this so bad! We have a really old mop that needs replacing. I have a Shark vacuum and love it. I love that the Pro Steam and Spray is easy to use, just like their vacuum. With a cat I am always vacuuming. I also need to sweep and mop quite a bit. I love that this steams. It sure sounds perfect for my home. I’ve been curious about steamers. This sounds great. I have two 5 year old boys and they are messy. Something to clean and sanitize at the same time would be awesome. It sounds like this mop can deep clean much better than a standard mop and bucket. This would come in handy with 3 kids and a dog! Thanks for the good review. I have been looking for something to clean my wood floors as I was not sure what was exactly safe for the finish. Looking forward to getting one. I’ve been looking into purchasing one of these! A big selling point for me is that there is no residue left on the floor! The Shark Pro Steam & Spray Mop is just what I need. Easy to use, light weight, Steam. I have fibromyalgia it is hard to scrub the floors. If I had the Shark Pro Steam & Spray Mop,it would sure make my floor cleaning so much easier. I’ve never used any type of steam mop before, and I am very interested in it. We’ve never had any carpeting or rugs – so this would be perfect. I love how it not only cleans but sanitizes, too. The wooden floors get so messy all the time! Having lung disease makes it hard to impossible to use cleaners in the house. I think this steam mop would be perfect for me to use! I love these. I have been checking this mop out debating on whether or not to get one. thanks for the great review! We have so much hard wood floors after removing carpet, and my floors never shine after i wash, i would love to see the difference after using Pro Steam spray mop, knowing that its none-toxic is a big plus in our house! That after picture does look great! I feel like I’m waging constant war against tracked in dirt (the animals of course can’t use the mat, but why can’t the people?!) and this would be a huge help. I really like how easy this is to use. This product sounds amazing! I love that there are several different settings for floor types. I also love that there’s no residue left behind! With having two dogs I need something that is easy and fast but it must get the job done, this shark pro steam sounds like this is a must for everyone or anyone….thanks for the review. Wow this sounds awesome! I have tile and wood laminate floors and the different modes sound great! Ever since I got my tile floor in my kitchen I have wanted to find something that cleans and sanitizes, since most cleaners leave a film on my floor. But to be able to use it on my tile and my wood floors is fantastic! I have a small steam shark. I love it for cleaning my kitchen floor. I have seen this one demonstrated and it has a lot more features to it and i hard wood floors everywhere else in my house and would love to have one of these. I enjoyed your review,with three roommates and a dog I need this machine. I love reading reviews done by fellow dog owners. They are soooo hard on floors and I am always struggling to find solutions for our hardwood. This looks amazing and I LOVE that it has a disposable pad option too! Yup! While we love our dogs they sure know how to wreck a house! I have been looking at one of these for a while. This would be perfect for my home, even my son can clean with it. I really enjoyed the review. Would love to try it. Thank-you for the chance. I would love one of these I’m my house. Non-toxic, biodegradable and safe around kids & pets with my son having a heart transplant and diabetes and my daughter having had cancer this would be great keeping my home clean for them. It’s great they keep coming out with great products that save time and money in the long run. I love that it’s not just a mop, but it has options to use. I woould love to have one of my own. This would be ideal for me, as I have artritis and it’s hard to do things, but this looks light enough and not so cumbersome as some machines that I could easily use it. I would use the Shark Pro Steam & Spray Mop on my tile floors. I like the heated cleaning spray and it would be great with the animals going in and out all the time. This machine is exactly what an old bachelor like me needs to keep my place clean. I live alone and hate cleaning…so I NEED it. After reading this review, I got this urge to go clean my kitchen floor. I own one of the portable scrubbers where you have to change the pads every time you scrub, so having a washable pad sure helps with the budget. Also, having an electrical cord gives the scrubber full power at all times. When the battery was going on the one I currently have, I wasn’t getting full power out of it. The steam cleaning gives me the assurance that my floors are sanitized clean, getting anything that the dogs might have left on the floor, like dirty feet, drool, and yes, even urine once in a while. I enjoyed your review…You did a great job on it! Kudos! The Shark Pro seems to be very good and I would love to have one for my office. I like the fact that I would be able to carry it around easily. It would be nice if I could win one of these. Used a friends of mine and works great. I was very surprise. Now I would like to have one very bad. Keeping my fingers crossed. I love that it not only cleans but disinfects as well.I’m sick of scrubbing on all found only to discover I’ve been just moving the dirt around the floor! I would love to have this cleaner!!! I like my floors to be clean for when my small grandchildren come over. The are always playing on the floors. We have hardwood floors all through our home and I love having them. I would love to have them really clean for my grandchildren. I’ve used a Shark Steam Mop in the past, and loved the way it sanitized and cleaned the floor to a nice shine. I was always amazed at how dirty the pad was after cleaning, when I thought the floor was pretty clean! Unfortunately someone used mine, and broke it! Would love one of these! I have heard they are awesome. We have linoleum floors in the kitchen and they sure could use this I think to make my cleaning easier. Being handicap makes it difficult to mop. I think these are really great for households with children. It looks easy to use and I love that you can have a reusable pad with it. This is a really nice steam mop. I like that it kills germs and cleans at the same time! this sounds like a great machine. I would love to have it. I love that this mop sets up quickly and easy to use. I get discouraged if a lot of assembling is required. I also like the 3 distinct mop settings that can be chosen. I have the older version of the Shark steam mop and I love it. I love the updated one and would love to try it. I would love to win the Shark Pro Steam and Spray mop to keep my floors clean and bright.I have always wanted one of these and would love to win one. This is so nice. It would help me clean up more. I find it very reliable and safe for use around my twins. It makes cleaning easier for me while I also juggle the babies. I would love to win this. It would make my housework go by faster. Great review, thank you! I really like cleaning accessories like this that are non-toxic – with kids and pets in the house, that’s really important to me. I also really like that switching from one type of floor to the other is easy, since I tend to clean one floor right after another – kitchen to living room to hallway to entryway. and include almost all vital infos. I would like to look more posts like this .